Background: The ability of modern implant dentistry to achieve goals such as normal contour, function, comfort, esthetics, and health to totally or partially edentulous patients guaranteed it to be more effective and reliable method for the rehabilitation process of many challenging clinical situations. In regard to this, the current study evaluates the effect of changing implant shape design parameters on interface stress distribution within the mandible bone. Materials and Methods: A numerical procedure based on finite element (FE) method was adopted to investigate the influence of using different body design and thread depth of the inserted implant on the final stress situation. 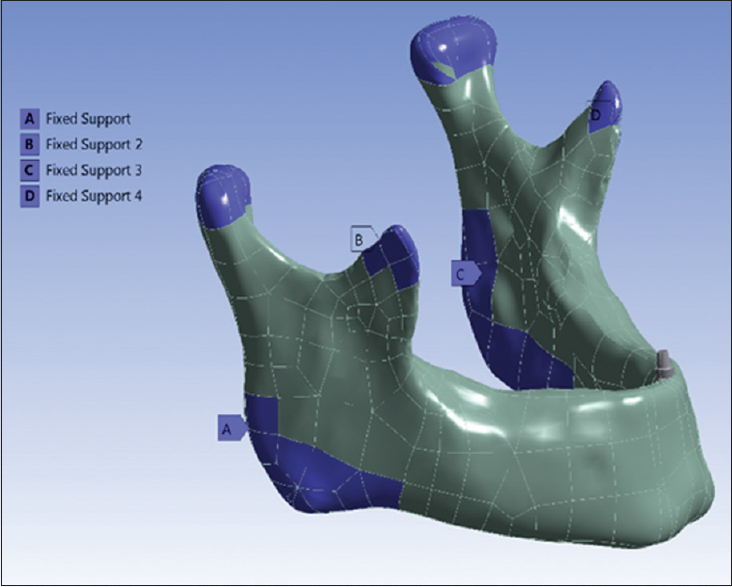 For the purpose of evaluation, a three-dimensional realistic FE models of mandible bone and inserted implant were constructed and analyzed using a pack of engineering software (Solidworks, and ANSYS). Six different commercial implant models (cylindrical and tapered) with three different V-shaped thread depths (0.25 mm, 0.35 mm, and 0.45 mm) were designed to be used in this study. The suggested implants used in this study were threaded in two different locations of mandible bone; the anterior region (Type I model) and posterior region (Type II model). A vertical static load of 250 N was directly applied to the center of the suprastructure of the implant for each model. Results: For both models, evaluations were achieved to figure out the stress distribution patterns and maximum equivalent von Mises. The results obtained after implementation of FE dental-implant models show that the highest stresses were located at the crestal cortical bone around the implant neck. In addition, the simulation study revealed that taper body implant had a higher peak value of von Mises stress than that of cylinder body implants in all types of bones. Moreover, a thread depth of 0.25 mm showed highest peak of maximum von Mises stresses for Type I and Type II models. Conclusion: The simulation results indicate that all models have the same von Mises stress distribution pattern and higher peak von Mises stresses of the cortical bone were seen in tapered implant body in contrast to the cylindrical body. Due to its sophisticated results regarding long-term stability and retention, dental implant had received a considerable attention by researchers who tried to enhance the implant body design and study all types of factors that facilitate or impede its behavior while inserted. In practical situations, many factors may affect osseointegration between bone and metal implant and consequently the state of interface stresses. These may include implant shape, diameter, length, angulation, type of loading,,,,, surface treatment, bone quality, and surgical technique., In particular, implant body designs with threaded features influence the value or kind of forces applied to the bone–implant interface. A cylinder implant design is much effective in transmitting more shear forces to the bone than tapered design, while on the contrary, the V or tapered design apply more compressive force than cylindrical implants. This indicates that for the cylindrical implant, the bone is strongest under compressive forces, weaker under tensile loads, and much weaker to shear forces. To understand the relationship between affecting factors and resulted bone–implant interface stresses, a multiple implant designs were tested in dental practice and many important geometry features were considered such as implant shape, length, and thread type and specifications., In addition to the aforementioned parameters, the total contact area between the implant and bone may be considered as one of the major design parameters that affect osseointegration strength of implant–bone interface. The osseointegration strength is also influenced by the implant surface treatment and implant thread pitch, depth, and width.,,, The density of the bone plays another important role in the outcome of the implant treatment in which high density increases bonding properties of the interface region. In addition to the experimental methods, theoretical analysis methods play a major role in investigating the effect of design parameters on stresses distribution and consequently on the quality of osseointegration in bone–implant configuration. The theoretical method was less expensive, and its results were acceptable since it offers both reliability and accuracy. Among these methods is the finite element method (FEM) which is considered as an effective research tool for dentistry since 1977. Using FEM complicated geometric structures such as mandible and maxilla bones are simply converted into meshes in a computer set. The simulation models consist of discretization features such as elements, nodes, and predefined boundary conditions. The resulted displacement and stresses which are mostly caused by loading on a part of the proposed structure or total volume can be calculated by a computer program. For several years, considerable effort has been devoted to the study the influence of implant geometry parameters on stress distribution in mandible bone. The researches show that implant diameter and shape, thread shape, insertion depth, and loading angle were significant factors influencing the stress created in the bone.,,,, The deformations and compression stresses emanated in bone and implant due to different bite forces will increase proportionally with the increase of the force whether it is applied horizontally, vertically, or in oblique directions. This increase will be accompanied by a decrease in implant lifetime and the neck zone of the implant system will be the most critical region. It is well known that most research works done with this aspect used either a simplified geometry or a localized zone of the bone to predict local stress distribution in implant–bone combination. The current paper conducts a three-dimensional (3D)-FE study to investigate the precise situation of the resultant stresses in implant-mandible bone configuration system due to applying a 250 N compressive force. The designed implant was immersed in two different regions of the mandible bone (interior [Type I model] and posterior [Type II model]). Two different shaft designs (cylindrical and tapered) were considered in addition to optimizing three different thread depths (0.25, 0.35, and 0.45 mm) to identify both optimal and worst design parameters that may affect life and stability of the proposed implant design. The proposed null hypothesis for this work was that there is no difference in stress distribution emanated during implant loading when using different implant designs with different thread depth. 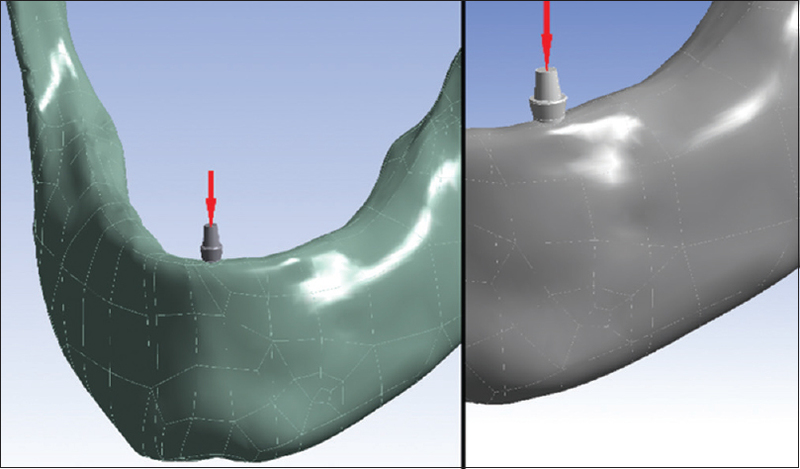 To implement the FE analysis (FEA) of the implant-mandible bone whole structure, a computer-aided design (CAD) model was first created with the assistance of using computerized tomography Scanner, SolidWorks, and ANSYS Workbench 14 software (Ansys Inc.; Canonsburg, PA, USA). In this work, the computed tomography (CT) offered a wide versatility in capturing the accurate details and properties of the living complex structures that are going to be anatomized first and later analyzed using FEA. In addition, CT has the ability of material properties inclusion according to bone density, this feature simplified differentiating between cortical and cancellous bones. To account for an accurate FE model and resembling the real situation, a real jaw bone picture for an adult human donator of 65-years-old completely edentulous patient was first created through using CT skull images. A total of 209 CT skull slices with a pixel size of 0.488 mm and slice increment of 1.0 mm were generated and used in the form of (Digital Imaging and Communications in Medicine [DICOM]) file data. Then, the DICOM files were exported to a 3D-slicer software (Ultimaker B.V., geldermalsen, Netherlands) and converted to 3D model. The software has great features such as segmentation and separation which help a lot in the extraction process of the mandible. To distinguish between cortical and spongy bones as two different materials, the software features thresholding, segmentation, and erasing were applied again to separate the spongy bone from the compact alveolar bone. The completed 3D CAD-model file of the mandible was exported as series of stereolithography (STL) files for use by other software and/or rapid prototype manufacturing technologies. The next step was to transfer the STL 3D models of the cortical and spongy bone of mandible into Solidworks software (Dassault Systèmes SOLIDWORKS Corp, Waltham, Massachusetts, USA) to create 3D solid models (SAT files) and then export these files into ANSYS software to implement FE analysis. For nonliving structures (implants), the current study treats them as an isotropic, so two independent material constants are required, these are Young's modulus and Poisson's ratio. In the present study, the thickness of cortical bones was evaluated using CT, and it was found that it is minimum thickness approximately equal to 1.2 mm. Six different dental implants were constructed by SolidWorks and then inserted into the mandible bone. Later, the implants were grouped into two design groups (cylindrical and tapered), with standard length of 10 mm, diameter 4 mm, pitch 0.8 mm, and standard V-shape threads with different thread depth (0.25 mm, 0.35 mm, 0.45 mm) as show in [Figure 1]. Six different cases were analyzed for each location (i.e., anterior and posterior) which mean an overall of 12 cases were considered in this study. For each implant, a conical shape suprastructure of (5 mm) was added. It is worthy to know that the current study assumes a state of optimal osseointegration was achieved (i.e., 100% of interface was satisfied), which means cortical and trabecular bone were assumed to be perfectly bonded to the implant. Figure 1: Illustration shows Group A (cylinder shaft) implants and Group B (taper shaft) implants. The goal of the current study was to assess the stress distribution in two different locations of mandible bone and for that purpose, the FEM represented by ANSYS workbench simulator was used to create assembly of all model parts, defining material properties, meshing model, applying boundary conditions and loading, and finally implementing the analysis. The cortical and spongy bones in addition to the proposed implant were assembled first and some Boolean operations were conducted to integrate different model parts together. A perfect contact between all the assembly parts (bone and implants) was assumed. A linear elastic behavior was imposed to all components of the bonded assembly and isotropic homogenous material properties were assigned as well. Values of Young's modulus and the Poisson's ratio for each material cortical bone, cancellous bone, and titanium are summarized in [Table 1]. For meshing purpose, the ten-node tetrahedral type of element which is recommended for complex geometries was used to mesh the models. To prevent displacement and rotation of the model during force application (i.e., zero displacement constraints), the mandibular models at the angle, coronoid process, condylar process, and temporomandibular joint were fixed in axial anterior-posterior, mesiolateral direction as shown in [Figure 2]. Figure 2: Fixation of lower jaw Type I and II models. Regarding load application, the literature showed that a value of vertical force that ranged between 100 and 300 N was applied.,, In this study, an axial load of 250 N was directly applied to the center of the suprastructure of the implant for each model as shown in [Figure 3]. A solver mode in ANSYS software calculates the displacement and then the stresses at each node present in the model. Quantities such as von Mises stress (equivalent [EQV] tensile stress), minimum principal, and maximum principal are used to evaluate the effect of loading forces on the peri-implant region or prosthesis structure. These stresses represent a measure of the elasticity of a material and give an indication about the point at which the elastic limit is exceeded and permanent deformation results. Visual color mapping used in stress contours images depicts stress location and intensity in which regions corresponding to greatest stress are bright red and regions of least stress are dark blue. All stress values were measured in mega Pascal. The effect of changing three different thread depths (0.25, 0.35, and 0.45) with two different shaft designs (tapered and cylindrical) on status of interface stresses between implant and mandible bone in Type I and Type II models were investigated. The proposed implant used in this study was of commercial dimensions of 10 mm length and 4 mm diameter. Following a previous literature work, a thread pitch of 0.8 mm was selected as the optimal thread pitch for obtaining primary stability and optimum stress production on implants with V-shape threads. The FE model dimensions of threaded implant were chosen in such a way that it satisfies functions such as maximize initial contact, increase the surface area, and to satisfy smooth dissipation of loads at the implant-mandible bone interface. Figure 3: 250 N vertical load application on suprastructure. Fine mesh of the 3D element model was generated, the number of nodes and elements generated by the 3D FE models are listed in [Table 2]). [Figure 4] shows the values of maximum EQV stresses values of supporting bone in type I models in mandible anterior region resulting from application of 250 N vertical load on the implant. It is clear that a ring-type stresses surrounded the implant neck and the highest EQV von Mises stress was found in tapered shaft implant of (0.25 mm) thread depth (T1), followed by tapered shaft implant of (0.45 mm) thread depth (T3), while lowest stress value was in cylinder shaft implant of 0.35 mm thread depth (C2). Figure 4: Chart shows maximum equivalent stresses in Type I models (anterior mandible bone) with different thread depth implants. Furthermore, in all implants of Type I models, it was clearly seen that stress concentration area at cortical bone structure was higher than that of spongious bone and the maximum EQV stress-bearing areas were located at the distal side of the neck of the implant adjacent to the first thread at the cortical bone structure [Figure 5]a,[Figure 5]b,[Figure 5]c,[Figure 5]d,[Figure 5]e,[Figure 5]f. As indicated by contour plots, the highest stresses were situated at the crestal cortical bone around the implant neck. 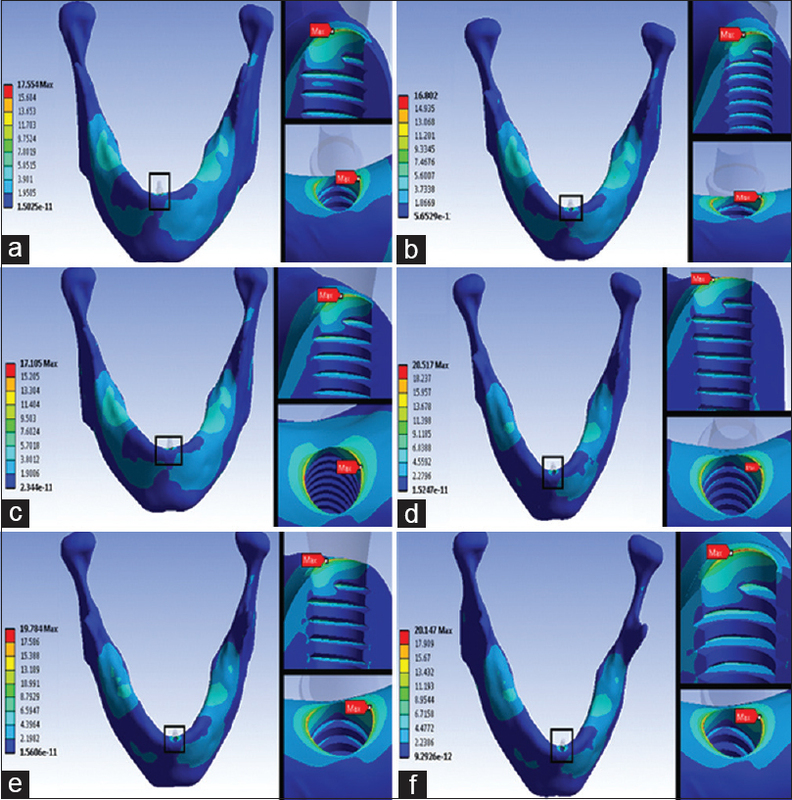 Figure 5: Distribution of equivalent stress pattern under 250 N vertical load in implant-mandible bone Type I model for a-(C1) implant, b-(C2) implant, c-(C3) implant, d-(T1) implant, e-(T2) implant, and f-(T3) implant. [Figure 6] shows the maximum EQV von Mises stress values in type II models in the supporting mandibular premolar area during application of 250 N vertical load. It is well shown in [Figure 7]a,[Figure 7]b,[Figure 7]c,[Figure 7]d,[Figure 7]e,[Figure 7]f that highest value of maximum EQV stress on bone was seen in (T1) implant (tapered shaft with 0.25 mm thread depth), followed by (T2) implant. The lowermost value of maximum EQV stress was seen in C3 implant (cylinder shaft with 0.45 mm thread depth). The success rate of cylindrical implants in both Type I and II bones was higher than that of the tapered implants. This was assigned to the fact that cylindrical implants generate less lateral force in Spongy I and II bones than the tapered implants. Figure 6: Chart shows maximum equivalent stresses in Type I models (anterior mandible bone) with different thread depth implants. Figure 7: Distribution of equivalent stress pattern under 250 N vertical load in implant-mandible bone Type II model for a-(C1) implant, b-(C2) implant, c-(C3) implant, d-(T1) implant, and e-(T2) implant. The effect of implant body design parameters variation such as thread depth, implant body shapes (cylindrical and tapered), and standard V-shape threads on stress distribution status in two different regions (interior and posterior) of the mandible bone was considered as the aim point of the current study. The null hypothesis states that implant shape design has a direct effect on the bone stresses during loading process. The screw shape of the implant body satisfies a wide contact area between implant and bone, which increases stability, reduces the shear stress in the bone–implant interface, reduces the stress concentration in the cervical region, and relieves stress concentration. The FEM represented by ANSYS Workbench simulation module was used to define the environmental loading conditions of the current problem and calculate bone stresses resulting due to applying a vertical load. The FEM is a numerical method of analysis in which the structure is broken up into set of elements interconnected by nodes, the loads are usually applied on either elements or nodes to calculate for stresses and deformations in structures of any given geometry. The completion of modeling process with high percentage of success depends on some prior issues such as accuracy in modeling the geometry and surface structure of the implant, the material characteristics of the implant and jawbone, and the loading and boundary conditions in addition to the biomechanical implant jawbone interface. In the work, a nondestructive method was used to create the study model with the assistance of CT and magnetic resonance imaging. While most of the previous studies used nonspiral dental implant models for the purpose of simplicity, the current study is not and high accuracy in both modeling and resulted obtained was achieved. The previous FE simulations showed that an implant in the form of threaded shape is more likely to transmit axial tensile or compressive loads better than the cylindrical type implant. This transmission occurs due to high retention after implant placement. The results obtained throughout this study showed that all models had a peak stress centered in the crestal region of the cortical bone and this agrees well with the results of the previous studies., The most likely explanation for this observation is the irregular geometry the study is dealing with, which in turn emphasize on the necessity of accomplishing an optimization study for both neck area of implant and crestal cortical zone of the bone which will enhance osseointegration between implant and bone and consequently decrease stress in the surrounding bone tissues. For the tapered implants, the peak von Mises stresses on cortical bone were higher than that of cylindrical implants due to high-stress concentration that occurs at sharp line angles located at the sides. In addition, it should not be neglected that thread implants showed great ability to dissipate interfacial stresses of bone. Although threads have multiple useful functions such as maximize initial contact, enhance functional surface area and facilitate dissipations of stress at the interfacial area, it should be realized that threads are classified as of the main reasons that cause implant failure. Considering cylindrical implants, the most likely explanation for why the cylindrical implants exhibit less stresses than tapered is the fact that cylindrical implants generate less lateral force in spongy bone than the tapered implants. The results also show that increasing thread depth will decrease and improve distribution of the maximum value of von Mises EQV stress in both types of implant. Biomechanically, this will result in maximizing the necessary area for osseointegration and providing good initial stability. From the total results of both models, a conclusion may be drawn here that suggests von Mises stresses are inversely proportional to thread depth (i.e., von Mises stresses decreases as thread depth increases), and this relationship is valid for both cylindrical and tapered implants. 0.25 mm thread depth showed highest peak of maximum von Mises stresses for Type I and Type II models. In relation to implant thread depth; 0.35 mm thread had minimum von Mises stress in the interior bone region as compared with 0.25 mm and 0.45 mm thread depth. Lan TH, Huang HL, Wu JH, Lee HE, Wang CH. Stress analysis of different angulations of implant installation: The finite element method. Kaohsiung J Med Sci 2008;24:138-43. Lan TH, Pan CY, Lee HE, Huang HL, Wang CH. Bone stress analysis of various angulations of mesiodistal implants with splinted crowns in the posterior mandible: A three-dimensional finite element study. Int J Oral Maxillofac Implants 2010;25:763-70. Tao L, Kaijin H, Libo C, Yin D, Yuxiang D, Jinling S, et al. Optimum selection of the dental implant diameter and length in the posterior mandible with poor bone quality – A 3D finite element analysis. Appl Math Model 2011;35:446-56. Noureddine D, Serier B, Bel Abbès BB. Stress distribution of the variable dynamic loading in the dental implant: A three-dimensional finite element analysis. J Biomim Biomater Biomed Eng 2017;31:44-52. Tarek AS, Raafat AT, Salah AY, Mohamed IE. Assessment of stress distribution around implant fixture with three different crown materials. Tanta Dent J 2015;12:249-58. Jemat A, Ghazali MJ, Razali M, Otsuka Y. Surface modifications and their effects on titanium dental implants. Biomed Res Int 2015;2015:1-11. Shi Q, Qian Z, Liu D, Liu H. Surface modification of dental titanium implant by layer-by-layer electrostatic self-assembly. Front Physiol 2017;8:574. Misch CE. Dental Implant Prosthetics. 2nd ed. Elsevier Health Sciences; MO, USA; 2015. p. 184. Huang HL, Hsu JT, Fuh LJ, Tu MG, Ko CC, Shen YW. Bone stress and interfacial sliding analysis of implant designs on an immediately loaded maxillary implant: A non-linear finite element study. J Dent 2008;36:409-17. Oswal MM, Amasi UN, Oswal MS, Bhagat AS. Influence of three different implant thread designs on stress distribution: A three-dimensional finite element analysis. J Indian Prosthodont Soc 2016;16:359-65. Abuhussein H, Pagni G, Rebaudi A, Wang HL. The effect of thread pattern upon implant osseointegration. Clin Oral Implants Res 2010;21:129-36. Ryu HS, Namgung C, Lee JH, Lim YJ. The influence of thread geometry on implant osseointegration under immediate loading: A literature review. J Adv Prosthodont 2014;6:547-54. Mosavar A, Ziaei A, Kadkhodaei M. The effect of implant thread design on stress distribution in anisotropic bone with different osseointegration conditions: A finite element analysis. Int J Oral Maxillofac Implants 2015;30:1317-26. Chowdhary R, Halldin A, Jimbo R, Wennerberg A. Evaluation of stress pattern generated through various thread designs of dental implants loaded in a condition of immediately after placement and on osseointegration – An FEA study. Implant Dent 2013;22:91-6. Weinstein AM, Klawitter JJ, Anand SC, Schuessler R. Stress analysis of porous rooted dental implants. Implantologist 1977;1:104-9. Qian L, Todo M, Matsushita Y, Koyano K. Effects of implant diameter, insertion depth, and loading angle on stress/strain fields in implant/jawbone systems: Finite element analysis. Int J Oral Maxillofac Implants 2009;24:877-86. Mohammed Ibrahim M, Thulasingam C, Nasser KS, Balaji V, Rajakumar M, Rupkumar P, et al. Evaluation of design parameters of dental implant shape, diameter and length on stress distribution: A finite element analysis. J Indian Prosthodont Soc 2011;11:165-71. Li X, Cao Z, Qiu X, Tang Z, Gong L, Wang D. Does matching relation exist between the length and the tilting angle of terminal implants in the all-on-four protocol? Stress distributions by 3D finite element analysis. J Adv Prosthodont 2015;7:240-8. Sun SP, Lee DW, Yun JH, Park KH, Park KB, Moon IS. Effects of thread depth in the neck area on peri-implant hard and soft tissues: An animal study. J Periodontol 2016;87:1360-8. Topkaya T, Solmaz MY. The effect of implant number and position on the stress behavior of mandibular implant retained overdentures: A three-dimensional finite element analysis. J Biomech 2015;48:2102-9. Cheng HC, Peng BY, Chen MS, Huang CF, Lin Y, Shen YK, et al. Influence of deformation and stress between bone and implant from various bite forces by numerical simulation analysis. Biomed Res Int 2017;2017:2827953. Meijer HJ, Kuiper JH, Starmans FJ, Bosman F. Stress distribution around dental implants: Influence of superstructure, length of implants, and height of mandible. J Prosthet Dent 1992;68:96-102. Geng JP, Weiqi Y, Wei X. Application of the finite element method in implant dentistry. 1st ed. Hangzhou: Springer; 2008. Sagat G, Yalcin S, Gultekin BA, Mijiritsky E. Influence of arch shape and implant position on stress distribution around implants supporting fixed full-arch prosthesis in edentulous maxilla. Implant Dent 2010;19:498-508. Eskitascioglu G, Usumez A, Sevimay M, Soykan E, Unsal E. The influence of occlusal loading location on stresses transferred to implant-supported prostheses and supporting bone: A three-dimensional finite element study. J Prosthet Dent 2004;91:144-50. Chun HJ, Cheong SY, Han JH, Heo SJ, Chung JP, Rhyu IC, et al. Evaluation of design parameters of osseointegrated dental implants using finite element analysis. J Oral Rehabil 2002;29:565-74. Reddy PM, Thumati P. A 3-D finite element analysis of strain around end osseous threaded and non-threaded implant-opposing natural teeth with regular occlusion and altered occlusion: An in vitro study. J Dent Implants 2014;4:53-61. Kong L, Liu BL, Hu KJ, Li DH, Song YL, Ma P, et al. 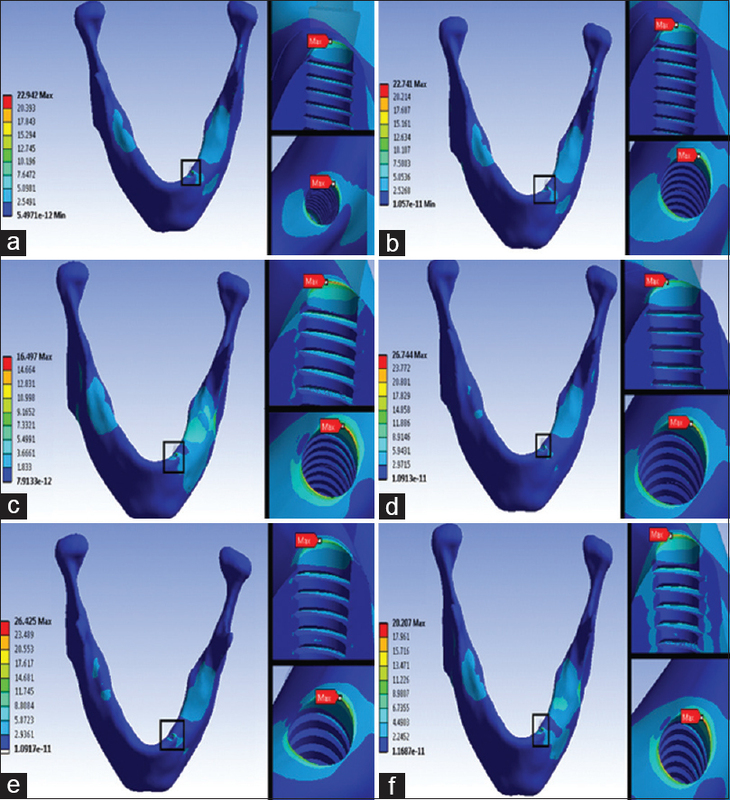 Optimized thread pitch design and stress analysis of the cylinder screwed dental implant. Hua Xi Kou Qiang Yi Xue Za Zhi 2006;24:509-12, 515. Torrealba Y, Lee H, Passos S, Nassar U, Pedroza J. Mechanical evaluation of 4 different implant design systems. Dent Implants Dentures 2017;2:114. Lee JH, Frias V, Lee KW, Wright RF. Effect of implant size and shape on implant success rates: A literature review. J Prosthet Dent 2005;94:377-81. Misch CE. Contemporary Implant Dentistry. 3rd ed., Ch. 3. Mosby, Elsevier; 2007. p. 32.